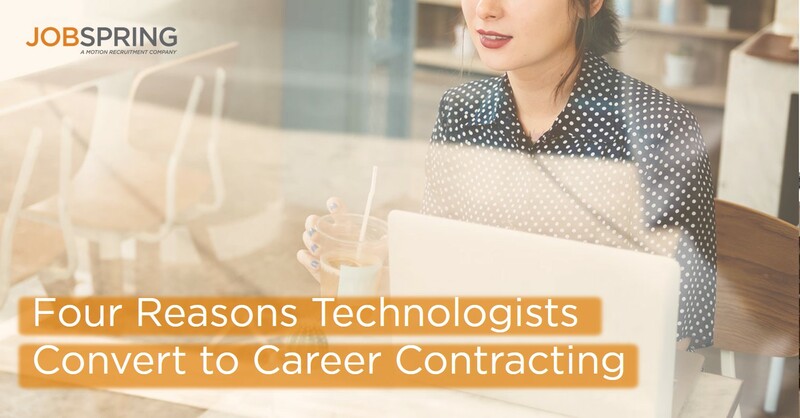 Tech contracting offers more flexibility and challenging projects than traditional roles, especially in tech — where the most cutting-edge, dynamic experience commands the highest paychecks. Keep reading if you're ready to catalyze your career with uncapped career potential in today's job market. Have you ever applied to a job where you need a certain level of experience, but need that job to get the experience? Building out a robust resume and portfolio takes time, as accumulating high-level projects with proven solutions require time to prove. Once you have the experience you need, how do you create a career where you have the flexibility to work on your own schedule, seamlessly move between projects and make more money than your competitors? For both common issues facing professionals, contracting has become an increasingly popular solution, whether they're looking for wider experience, testing out different environments, or carving their technical niche. For technologists, contracting has gained further popularity because it allows engineers to work with the latest tech, tools and products. As developers rarely stay in a role for more than two years, staying on 3-month to annual contracts ensures that your skills don't go stale. If you're looking to increase your 'market value,' flexibility and income, converting to tech contracting offers more short-term autonomy, coupled with greater long-term career potential, topped off with a higher hourly rate than your salaried counterparts. Contracts range between a standard 40-hour week to a 5-hour remote gig, with a duration of one week to beyond a year. The span of opportunities, compared to traditional roles, lend to designing and regulating a schedule that fits your life. While contracting has flexibility it's essential to establish a lucid agreement for of the the time commitment and expectations for the role. Plus, depending on the time commitment, some contractors will work for more than one company in a week, catalyzing their resume, or work up to 20+ hours overtime for one client. 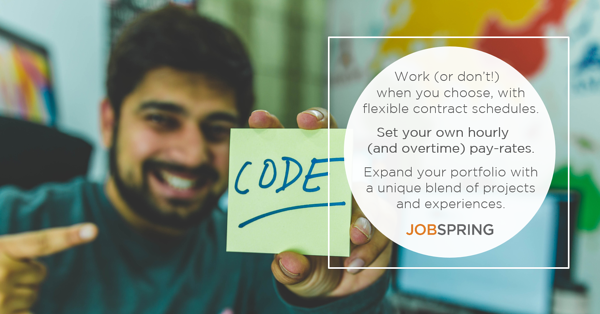 Another benefit of contracting's flexibility is the opportunity to convert to a full-time position at the end of an agreed contract. You have the luxury of committing to a team with whom you've established a positive working relationship and understand your fit with their culture. Alternatively, you have the freedom to move on without 'quitting' your job. Plus, some employers will go as far as to help you find a new opportunity, and give recommendations for the next position you're pursuing. If you work four six-month contracts consecutively, you’ll cultivate a more dynamic skill set and portfolio compared to someone who has in the same job for two years. The more diverse technical projects shows your aptitude, and thriving in different environments and team structures demonstrate the growth of your 'soft' skills. Plus, when your contract ends, you'll be able to move on with no hard feelings, and even a recommendation. For emerging tech fields like Artificial Intelligence — where there is a substantial tech talent shortage — you're in a position to snap up a ton of experience quickly, as companies figure out how to best scale their tech team. If you’re in between jobs, it is easier to secure a contract than a long-term position and can be the perfect stepping stone into your dream company, especially if you want some experience with a specific tech or industry. As a rule of thumb, the more experience you have, the more you can earn. For example, data scientists who have proven success in Python, R languages, as well as a robust background in statistics, math, and computer science are more valuable than your engineer counterpart who has been doing only Python for the last two years. Even though you make more on an hourly basis, some potential contractors may be deterred by the idea that you're not a 'salaried' employee, but hourly contractors often take home a higher rate than permanent employees, plus 1.5 overtime beyond 40-hour weeks. A rule of thumb to compare hourly rates and salaries: double the hourly rate, and multiply by 1,000. For example, a $40/hour role roughly equates to an $80k salary. 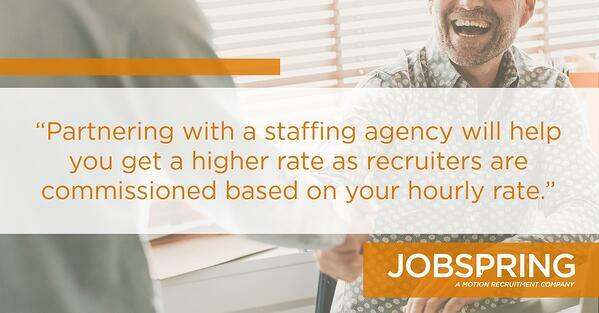 By partnering with a staffing agency like Jobspring, they'll help you get a higher rate, as recruiters are commissioned based on your hourly rate. For employers, contracting has become the strongest solution for staffing needs, whether they're scaling their tech team, or covering for vacant in-house positions. Additionally. they may hire you as a subject matter expert to complete a specific project on a more consultative level. Because they're not committing to a long-term employee, there able to offer a higher hourly rate since they're not offering you a 'long-term' position. Independent contractors file a 1099, which is paid out without any withheld taxes. If you’re working with a staffing agency like Jobspring, you're technically hired by the agency, but work out of and report to a client's office. The agency will pay you weekly with a standard tax management, health benefits, a 401k and more. If you’re looking to broaden your experience, diversify your skills and get perspectives of different management styles, company cultures and practices, contracting might be your calling. With a long list of references and experience, you’ll be a stronger perfect candidate. 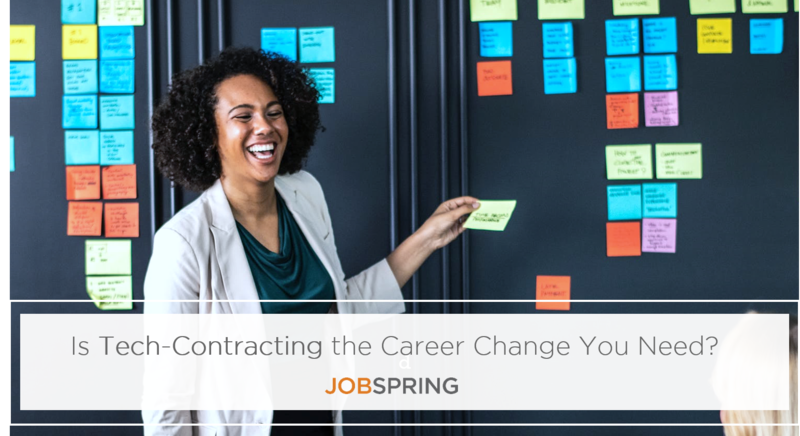 Partnering with a specialized recruiting agency like Jobspring Partners ensures you get the best offer possible, and maintaining open communication with your recruiter throughout your assignment will lead to optimal results onsite. Have you’ve ever looked over your company’s payroll? If so, you’ve likely noticed that Software Developers are some of the highest-paid employees today. This is no surprise, as they’re responsible for everything from supporting your sales team’s CRM, to updating (and deleting) Instagram’s latest design. Plus, without the GPS technology they coded guiding our commutes, we’d literally be lost without them. Software developers will rarely stay in a seat for more than two years, and are fast to move in the tech market as enticing offers with newer tech and higher salaries arise. Successful hiring managers keep a pulse on the latest performance incentives, perks and localized tech salary rates to keep their developers challenged intellectually and comfortable in their culture. Losing tech talent can derail your projects, profits and morale, and finding and training a new hire is time consuming and expensive. 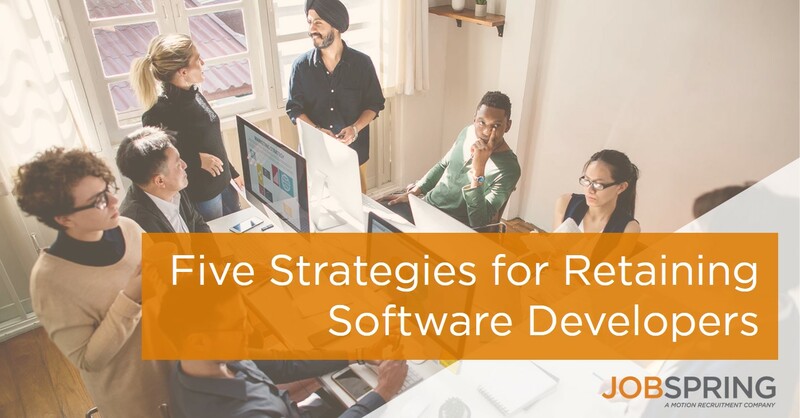 If you're a hiring manager struggling to keep software developers on your team, consider our five best strategies for retaining software developers in today's competitive market. While it's said a watched pot never boils, a watched engineer is quick to boil over. Micromanaging engineers is rarely sustainable, especially if they’re overseen by a manager without a strong technical background. If you’ve been clear with your goals and challenges, trust your software developers to keep your code....up to code. Most experienced developers thrive with the freedom to work efficiently and creatively; if you trust their skill-set and overall understanding of your goal, give them the tools and space to solve the problem. Take the next step in decreasing their frustration from your development team by minimizing technical reports, or doing away with them altogether. Beyond work, give them the freedom to play. Encourage developers to experiment and innovate on the projects that matter most to them. By providing similar room for you to challenge your software developers to tinker and play with the newest tech, you might even get your next great initiative out of this dedicated time. A company with a longstanding engineering strategy won't be able to, or want to, keep up with every trend in the marketplace, and most new tech has not been proven at a mass-production level. But, the smart companies can account for this by allowing their engineers 20 percent of the time playing with new tech and do exploratory R&D, and the rest dedicated to ROI-related work. Some of the best products come out of this creative time. Especially if you can't afford to compete with the highest salaries, the freedom to work and develop their interests is more valuable, and a cost effective way to keep your developers feeling fulfilled in their current seat. 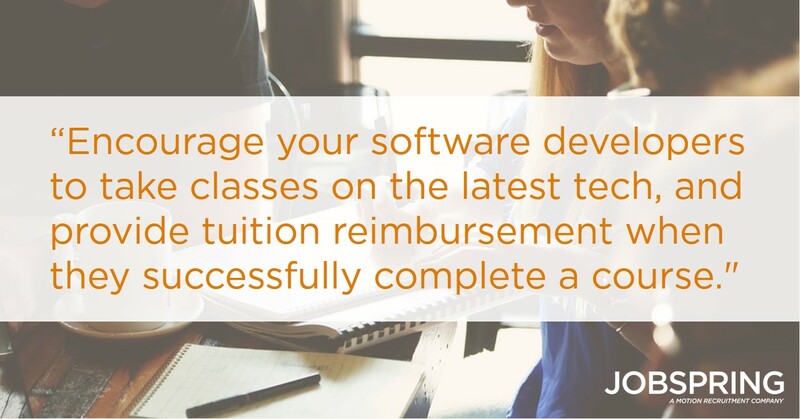 To take their growth a step further, encourage your software developers to take classes on the latest tech, and provide tuition reimbursement when they successfully complete a course. Developers know that their tech is evolving so quickly, they can become anxious about staying on top of the trends. By sponsoring them at advanced learning classes at groups like General Assembly, not only will your developers feel that they are on top of the latest software trends, but grateful that they can take their new knowledge and apply it to your goals. It is one thing to explain to developers what you want done, but it is wholly as important to explain why you need it done. With developers deep in code, they might lose sight of your branding, audience and revenue goals. Keeping them up-to-date with company-wide accomplishments and struggles will help them feel more ingrained in your larger mission. Guide them to understand exactly how their roles as software engineers are essential to the business. Beyond feeling satisfied in their seat, they will feel as though they are a vital contributor to something bigger than themselves, a key mentality to keep employees engaged. By making an effort to seek out and offer better benefits, your developers will more likely feel confident about staying exclusively on your team. Most employers offer 401k, health benefits, paid and sick days off, so competitive tech hiring managers are going above and beyond by offering commuter benefit programs, catered meals, private events and bonuses. Like software itself, the careers for software developers are constantly evolving, which is why, as a manager, it's imperative to stay ahead of the latest trends, both in tech and culture, alike. Even with a leaner payroll, you can be generous with scheduling options, including four-day work weeks or remote days to improve your team's work-life balance. With popular communication tools like Slack and FaceTime accessible to all your tech team, software developers careers can improve with the freedom to work quietly and creatively, without sacrificing collaboration. It's not just about having a website or an app anymore, a strong tech team is key to staying both competitive and protected in today's rapid market. Hiring software developers capable of growing your company's tech is essential – which is why keeping software engineers on your team long-term requires vigilance and flexibility. 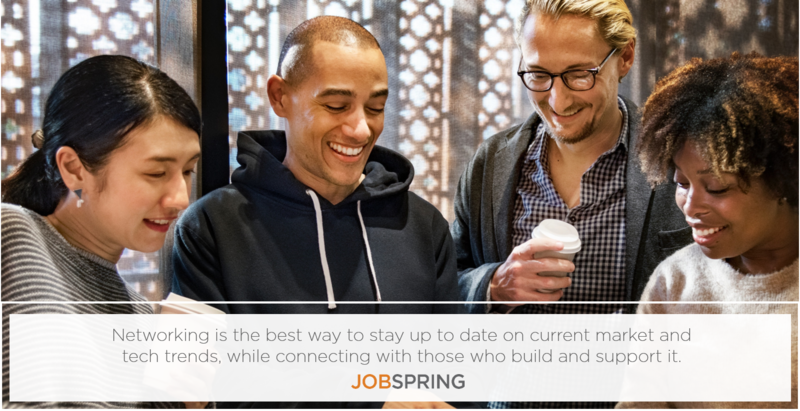 At Jobspring Partners, we’re committed to helping you build your teams of specialized tech developers, vetting their skill-sets and readiness for your open developer role. Once you’ve brought on a new hire, you still need to be vigilant in order to retain the software developers with your team long-term. You can retain developers by making them feel valuable and giving them the tools they need to succeed, the freedom to work, play and grow. While keeping up-to-date with salaries are important, treating your developers like valuable, integral members of your company is the best way to keep them committed – and retained securely on your payroll. BOSTON, December 13th, 2018 – Motion Recruitment Partners, parent company of North American IT Staffing agencies - Jobspring Partners and Workbridge Associates, and global Recruitment Process Outsourcing (RPO) solution provider - Sevenstep, announced today that it has acquired MDI Group. MDI Group is a leading IT Staffing firm and Managed Service Provider (MSP) with offices in Atlanta (GA), Greenville (SC), Charlotte (NC), Dallas (TX), Fort Worth (TX), and Phoenix (AZ). MDI also provides the ID² workforce solution – a unique technology training, certification and deployment program to address the ever-growing skills gap in the IT sector. MDI’s proven suite of talent solutions, 30 years of valued client relationships, and unique geographic presence provide the ideal blend of expanded capabilities to complement the Motion Recruitment platform. This acquisition adds six new IT Staffing offices and three new US markets (Charlotte, Greenville, Phoenix). It also adds the Managed Service Provider (MSP) capability to Sevenstep’s global talent solutions suite including: Enterprise & Project RPO, Employer Branding, and Data Analytics - Talent AI™ offering. MDI’s ID² workforce solution will be a valued solution applied across the enterprise to both Staffing and RPO customers of Motion. Founded in 1989, Motion Recruitment Partners LLC is parent company to a group of leading recruitment solution providers and game-changers in the industry with a focus on providing support of the modern employer’s ‘total talent’ needs. 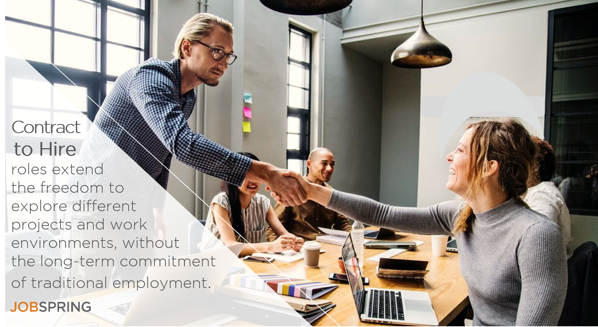 Jobspring Partners and Workbridge Associates both provide IT Staffing for Contract and Permanent recruiting needs and Sevenstep provides global RPO services, talent analytics, and employer branding services across a broad range of industries for both Permanent and Contract labor. With the tech-industry unemployment rate dropping to an impressive 1.8% nation-wide in May of 2018 according to Dice, it is easy to understand why hiring managers and talent acquisition professionals alike are experiencing heart-ache when thinking about tech hiring initiatives this year - and hiring veterans could be a solution for more than a few reasons. The midterm elections saw eight veterans elected to Congress, and in the current hiring climate, what does this mean for the future of veteran employment? Currently, there are nearly one million unemployed military veterans in the U.S. according to the House Committee on Veteran’s Affairs, and with the changing political climate, more veterans could be returning home to join the domestic workforce. Having worked with military veterans throughout his career Del Crockett, VP of Sales & Operations at Motion Recruitment Partners, has a few great reasons why companies should hire veterans to address their biggest hiring problems. Working in high technology recruiting for the last decade, Del has seen his fair share of hiring markets over the years, and he thinks that today's hiring landscape is easily the most difficult he’s seen for companies to navigate. Quite simply, he says, are looking at an Economics 101 problem to the max degree: High demand and nearly zero supply. To curtail the depressing amount of supply on the market, numerous development boot camps have popped up to teach non-technical professionals to become developers. Although that has been questionably effective, it begs the question, what about our military veteran resources out there? How are we overcoming common misconceptions and utilizing their unique skill set to impact technical hiring agendas? The squeeze on the technical talent pool has not only forced companies to broaden their technical expectations, but also take into serious consideration the "soft skills" and/or "intangibles" that can end up making a candidate a fantastic hire over the long term. Del and his team are regularly seeing companies make offers based as much on intangible soft skills as they are technical abilities. With that trend inevitably growing as the market continues to tighten, it is a great time to be looking at our veteran's as a high-quality option to fill technical roles. Below, Del shares how bringing on a veteran addresses three hiring challenges he hears about every day. Company Feedback: If I had a dollar for every time I received feedback from a hiring manager stating that a candidate was "technically great, but not the right culture fit"...The truth is that culture fit is beyond critical, especially for small to medium sized companies. Most clients I work with will overlook some technical ability to find someone with a "go-getter" attitude that is ready to learn. In a hiring landscape dominated by more and more candidates feeling entitled due to the current demand, it's not unusual to see hiring managers pause when faced with the decision on someone who might be a detriment to the team/company culture. Why hire a veteran: Maybe because teamwork and trainability are possibly a veteran's best attributes. Early on, those in the military learn that to become a good leader, one must be a good follower. Rising through the ranks is a rite of passage that must be earned and the same can be said in most companies. Finding a candidate who believes in these concepts will ultimately benefit the growth of the teams, its operation and overall retention rates. Company Feedback: Let's face it: Programming environments have their moments of being high pressure, there is no way around it. Start-ups? How about every day! With the typical development team working on a two-week sprint cycle, the ability to handle deadlines calmly is as critical as the quality of code you put out. Like coaches, hiring managers love finding job seekers who they can count on, come crunch time. Not everyone has the mental strength to execute come "crunch time" on a consistent basis. You're either clutch or you're not. Why hire a veteran: Veterans have become accustomed to making important decisions (sometimes life dependent) for themselves and their team under the most intense situations. The ability to solve problems under the most unparalleled circumstances is a quality that every hiring manager can use, especially at start-ups. Are you a veteran looking for a job? Apply to a job in D.C. or a city near you! Company Feedback: With famed companies such as Facebook and Google constantly re-shaping the technical landscape, it is understandable that many of today's candidates can find themselves getting hyper-focused on today's "hottest new technology." Unfortunately, for many hiring managers, that latest technology may or may not be a critical element in their current production environment. Even when it is, many candidates only understand the overarching general concepts rather than the in-depth details on the "why" and "how" the technology can be utilized in a real production environment. This inability leaves companies vulnerable to low quality code and implementation, causing bugs, delay, and often-times, resentment within the team ranks. Why hire a veteran: Officers and soldiers in the field are trained to keep an impeccable sense of detail with everything they do. From the way they dress and keep quarters, to addressing tiny logistical details on the battlefield, veterans are trained to embrace the responsibility of always being meticulous, while working towards the big picture. This is a trait that is nearly impossible to find in today's hiring market. Considering that the slightest mistake in a line of code can be the difference between a product being received well from users and the same product totally failing due to bugs or security concerns, having staff who embrace "getting lost in the details" can make all the difference. According to Joseph Kernan, NS2 Serves Chairman and Vice Admiral (Ret. ), U.S. Navy, in an article from the Business Journal, "Hiring a veteran not only provides your company with a devoted employee who has the potential to become a highly productive member of the team, but you're also giving a deserving veteran a fresh start in post-military life and a chance at a fulfilling career." Looking to hire a veteran? 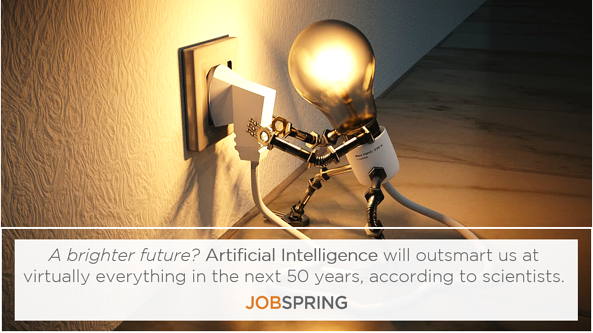 Contact Jobspring here so we can help find you the right talent for the job. Is Tech-Contracting the Career Change You Need? The job market has experienced several shifts in recent years, as the new 'gig economy' challenges the traditional five day, 40-hour work-week. A popular solution to come out of this shift is contracting, limited-time employment agreements, often ranging between three months to a year, depending on the depth and demand of the project. Per the specific contract agreement, you can work part-time from home, or a traditional 40-hour, 9am-5pm schedule in their office (or a healthy balance in between). Now, let's bust a common myth: many job seekers new to contracting opportunities believe it is an unstable employment option with uncertain pay. In fact, you can potentially make more money, optimize your schedule and advance yourself professionally by becoming a career contractor. Keep reading to discover if contracting is the right career move for you! Yes, you read that right — contractors often make more money than full time employees. Working a contract position frees you from paying into the standard, and sometimes automatic, benefits packages that are included in full time roles, often lowering your net paycheck. As a contractor, you’ll get a direct dollar amount for the work you put in, giving you more autonomy over your earning potential. Whether you're a Software Developer looking to design a revolutionary app, or a DevOps Engineer looking to build out your AWS experience, contracting gives you the freedom to sample different work styles and professional environments — then walk away on great terms at the end of a project. By contributing to multiple companies instead of investing all your skills into one, you're able to quickly strengthen your resume and increase your odds of capturing unique and lucrative opportunities moving forward. Several contract positions are contract to hire, meaning if you have a positive relationship with your contract employer and want to stay on board, you can be converted to a full-time employee. Pro tip: If you choose to leave at the end of a contract, try to maintain a healthy relationship with the company so you can use them as a referral for your next role! Alternatively, if your contract ends and you’re ready to leave the company, you can do so on good terms. If you're working with a great tech recruiter, they can help ensure that you have the next role lined up before active contract is complete. Compared to a traditional, static role, you will be working with different teams and companies, producing a richer professional network. As your skill set and professional network grow, you symbiotically create opportunities for contracting and consulting opportunities down the road. Kick-start your network growth with groups like Tech in Motion, a free tech-networking event series, operating in 12 cities across North America. At the events you’ll be able to network with other tech professionals, learn from panelists, observe tech demos, and gain free career advice from experienced tech hiring consultants. As the traditional employment model shifts from a holistic full-time employment base, toward consultative, contract-based roles, technologists have a unique opportunity to increase their income, control their work schedule, and advance their careers with a diverse and dynamic background. Whether you are building a team from scratch, filling a vacant seat, or hiring a consultant for that new project, the biggest challenge is finding qualified talent. No matter the industry, hiring skilled workers today is difficult. 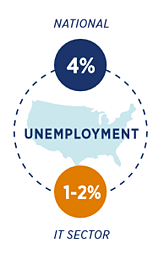 Unemployment has hovered at 4% nationally for some time now; in specific sectors, such as IT (computer programmers/information systems), unemployment is as low as 1-2%. In 2010, the hiring landscape was drastically different. Qualified talent was readily available, so employers had a large pool to draw from for every hire. Following the Great Recession, companies adopted intensive hiring processes designed to arduously vet each applicant. Businesses were bearish on the market, and did not want to make a costly hiring mistake. This led to long interview practices, multiple screening techniques and ultimately, indecision. Nearly a decade later, many companies have maintained the same extensive hiring practices despite today's modern marketplace. But in order to make a successful hire for a growing team, or bring on that consultant for your software application, hiring practices holistically need to evolve. In tech, highly-skilled candidates are often on the market for less than a week. With this in mind, companies can no longer rely on the hiring “luxuries” of the past. Employ these tactics to improve how your hiring team attracts and on-boards top talent in today’s fast-paced market. Be open to hiring candidates who have less than 100% of the required skills for your role, but possess the aptitude and attitude to attain them. Yes, this may seem counter-intuitive, but the long-term benefits can be invaluable. Not only does it take longer to find the candidate that checks off all the boxes on the job requirements, but the 'ideal candidate' is more likely to grow bored quickly and start looking for that next challenge sooner, putting you in the potential position of needing to re-fill that role again. Alternatively, hiring someone with only 70-80% of the required skills gives them room to grow into the role. Consider hiring them as a contractor (a six-month contract is the industry average). Once they have proven their value, you can then convert them with confidence as a full-time employee of your company. Most importantly, these less-experienced candidates will want to accept your offer. The odds of having them accept and start with your company will increase drastically. With time-to-fill decreasing, and increased engagement from your new hire, your team will be moving in the right direction in no time. The biggest advantage you can give yourself in this market is speed. If you find a contractor or candidate you like and can do the job -- hire them. Waiting days or weeks to make a formal offer can hinder the candidate’s experience, which decreases the likelihood that they accept your position. 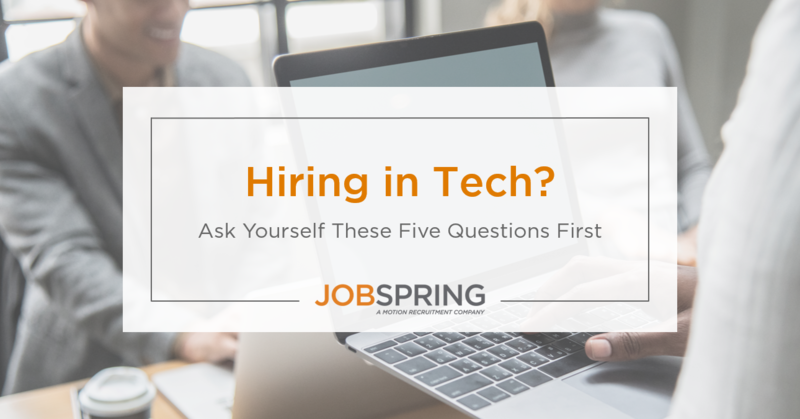 Within the tech sector, the average candidate interviews with at least three companies. Being decisive, and flexible with your requirements, and moving quickly will help you attract the mission-critical talent you need. Shorten your process by skipping the phone screen. Instead, line up 3-5 quality applicants to come in within a 2-3 hour period and do speed-round interviews of 20 minutes each. Not only will you get a better sense for their qualifications and culture fit, but you will be able to better sell your opportunity. Can’t skip the phone screen? If you like the candidate while speaking with them, schedule that in-person interview with them live on the phone. We suggest having that next meeting happen within 48 hours of the first call. Whether you’re considering working with a MSP provider or partnering with a staffing firm, make sure to carefully vet your third-party vendors. Look for vendors who are specialized and localized. Hiring for a Software Engineer in Washington, D.C. is very different than hiring for one in San Francisco. 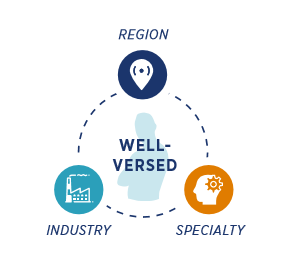 You will want to find someone who is well-versed in your region, industry, and specialty. Not only will they understand the local market better, but they will be able to use their network of contacts to give you the competitive edge you hired them for. You’ll also want to consider your vendors’ sourcing capabilities. In a market where actively-interviewing talent is basically non-existent, the suppliers who focus on and invest in sourcing technology and best practices will be your most reliable partner. These vendors likely to have extensive pipelines of both active and passive candidates Local vendors should be meeting with each candidate in person and build a strong relationship, which they can harness to ensure the candidate accepts your offer. Look at their track records of percentage of offers accepted and contract assignments completed. These metrics will give you a good indication of whether the vendor is one you want to partner with. The competition for talent, coupled with increasing business demands, make finding the right contractor or employee a daunting task. Before implementing these tips, do an audit of how you hire and who is involved in the process. Changes to hiring, specifically within the enterprise environment, can be difficult. Get the right stakeholders or business leaders involved and committed to helping change your hiring practices. Look for talent with ability, be prepared to move quickly, and be selective with your vendor partnerships to stay ahead of your competition. James Vallone is the Vice President of IT Staffing Solutions at Motion Recruitment Partners, where he has more than 16 years of staffing and recruiting expertise. Nicholas Campo is the Regional Director of IT Staffing Solutions at Motion Recruitment Partners. He has more than 10 years of industry experience providing innovative solutions to hiring. It's no secret that technology is evolving rapidly, which can make keeping up with the latest trends a daunting task. Two decades ago, the "World Wide Web" was a chimera; today, nearly half the world's population can access the internet from their pocket. As visionaries like Steve Jobs and Elon Musk, and companies like Amazon and Google, compete to hurdle tech's capabilities forward, the 'next generation' of tech arise on a more frequent basis. Besides becoming a full-time tech blogger, how can anyone stay fully in-the-know? To help you stay on the cutting edge, our team assembled all the latest trends, from Artificial Intelligence to Zero-Knowledge Proof and everything in between. 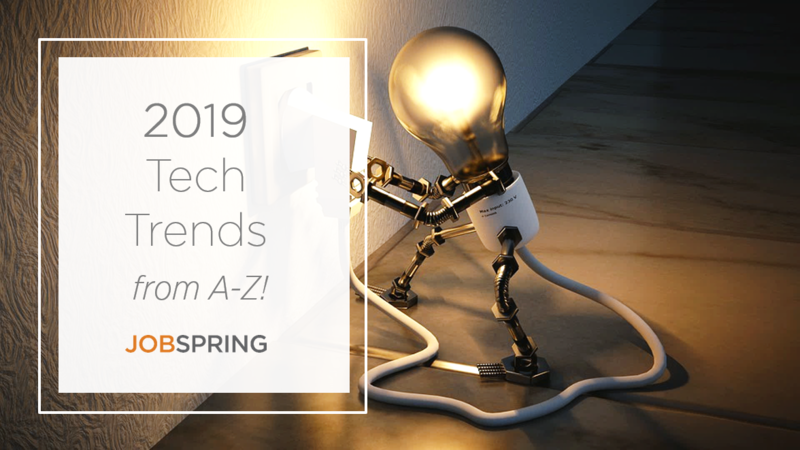 Keep reading to see the latest and greatest tech trends from A-Z. The recent AI boom unleashed the potential for machines to think and learn autonomously – which many believe foreshadows a Terminator-like demise for mankind. In fact, scientists at MIT predict that these machines, which combine bulk data with immediate, algorithm processing, will outsmart us at virtually everything in the next half-century. If that sounds too futuristic to be true, the proof is in the profit; after reaching a value of $1.5 billion in 2016, AI software is projected to reach $60 billion by 2025. For skilled AI developers, annual salaries range between $300,000 to 500,000. For the foreseeable future, it can dramatically enhance our businesses and lives – unless that's what the machines want us to think. Aren't you relieved we didn’t say Bitcoin? As the fate of cryptocurrency hangs in uncertainty, the peer-based tech, decentralized platform on which it is built, is proving market fortitude. We've traditionally relied on databases owned by private companies to store our information – relinquishing control over our sensitive, saved data including bank details and health records. Blockchain is regarded as the backbone to a new type of internet, the solution to increased security breaches and consumer distrust. Follow the money: since 2012, VC's have invested more than one billion into blockchain, with a significant interest in banking and financial sectors – which stand to save up to $12 billion each year by incorporating blockchain into their technology. Last year, Equifax's infamous breach shed light on the intense, global demand for better cybersecurity. 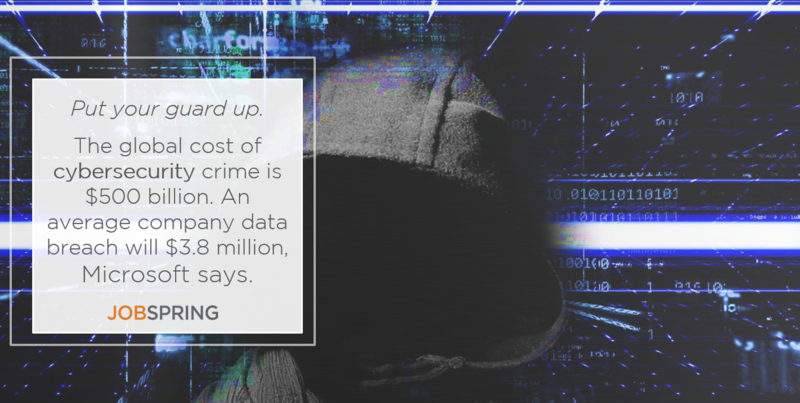 Cyber-crime damage costs are likely to exceed $6 trillion by 2021, which will open 3.5 million unfilled cybersecurity jobs – a fairly safe bet for a sustainable career. Today, there is already a hack every 39 seconds, affecting a 1/3 of Americans each year. The number of devices in our home that are 'smart' or Internet of Things-based has only enhanced this threat to our private information. Since there will be up to 200 billion of these connected devices by 2020, you should start brushing up on your risk-analysis skills today. Following the Big Data craze, companies found themselves wallet-deep in analytics, of which they lacked the skills to find interpret meaningfully. This bottleneck spurred the demand for Data Scientists, capable of performing analysis, engineering, and modeling to derive meaningful results from proprietary data. Field specialists are uniquely suited to drive productivity, efficiency and growth for their organization. Not sold yet? Data Scientists report an 88% job satisfaction, likely enhanced by the meaningful nature of their work. Plus, the recent Cambridge Analytica-Facebook scandal, in which sensitive data of more than 85 million users was manipulated, proves just how potent data can be when harnessed effectively. Surprised you haven't seen 'cloud' listed? That's because Edge Computing is creating a full-on tech storm. Cloud platforms can handle large amounts of data, but lack the bandwidth imperative to work with all IoT devices. Edge computing can reduce latency delays and costs while improving network efficiency. The frontier of computing will steer away from centralized nodes to a networks' logical extremes – enabling analytics to be gathered at the data's source. Actions can be completed within a few milliseconds, rather than a few hundred milliseconds. While this contrast seems trivial for Alexa, it can mean life or death when sending data to and from driverless cars. But with Telsa and Apple, and endless VC's, channeling their energy into producing this technology, we can expect to see it coming soon to devices near you. Once a mainstay of Sci-Fi movies, facial recognition iapps going mainstream. While iPhone X users can't stop promoting the convenient feature, this year will bring Facial ID into our pockets. Biometric solutions to security threats will be featured in mobile devices and standard video systems and more. Think different? Looking toward the future, Apple recently announced a $390 million investment into this development, essential for enhancing their portrait mode, animoji, true depth features and more. Verizon is dominating headlines with their 5G service, touting improved wireless speeds, data capacities and fewer delays. Smartphones with 5G will be available in 2019, but tech companies are clamoring to invest and claim ownership this year. Google is currently testing solar-powered drones that can stay up in the sky for as long as five years and beam down 5G signals to users. 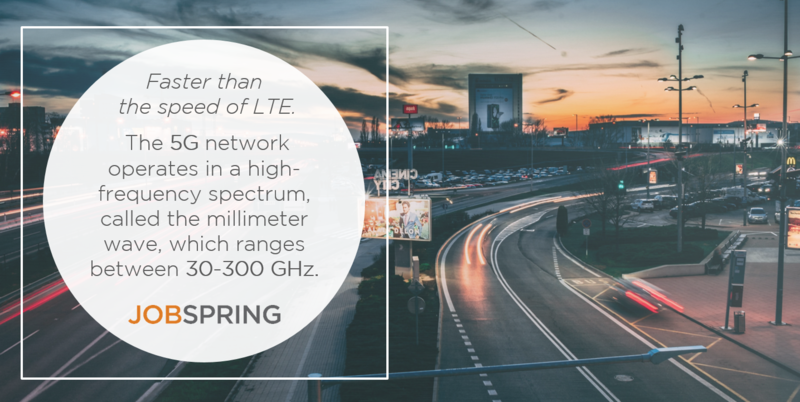 So, how fast is 5G? A two-hour movie took 26 hours to download on 3G, six minutes on 4G and a mere 3.6 seconds with 5G. This speed will enable a world of wireless communication that brings us closer to a wholly 'smart' planet. With this amazing new capability, only one question remains: can you hear me now? The rising health costs and the growing senior population are the driving forces behind Health Sensors, which have the potential to catch medical abnormalities faster than before. Enabled by wearable tech, sensors can increase the intelligence of life-supporting implants and sensors can be employed for identifying advanced symptoms and preventing serious illnesses. But, what is on the inside is most important; many industry-leading HealthTech firms have been testing embedded devices to collect health metrics like electrocardiogram movements and blood pressure readings. Alexa, what's IoT? 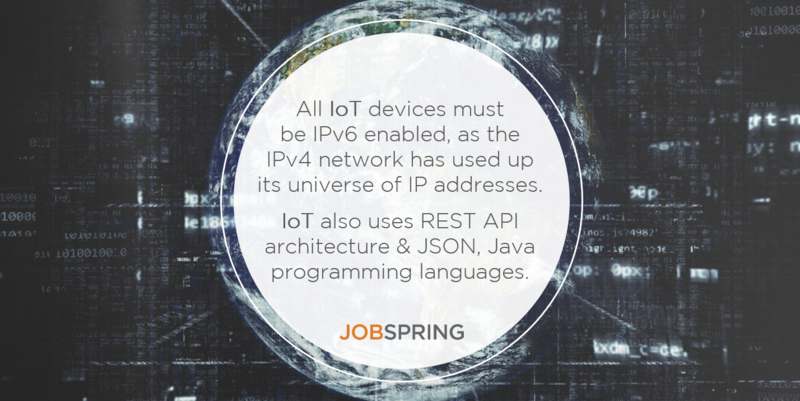 IoT encompasses smart, connected products like smart phones and smart watches and vehicles. The future of personal assistants and smart home products means this technology will sync to almost every facet of your life. With more than $800 billion spent on IoT markets globally, and more than 60% of global manufacturers using IoT-sourced analytics, it's predicted there’ll be 75 billion connected devices by 2020. Now the official development language for Android, Kotlin is considered the most-loved language by programmers. The 'pragmatic language' is being adopting quickly by traditionally Java Developers because it has 100% interoperability with their existing frameworks. Plus, Kotlin's null-safe language is rapidly being adopted in Silicon Valley because offers a smarter way for sever-side development. If it didn't sound versatile enough, Kotlin can be used in both Object Oriented and Functional Programming styles. With this level of klout, Kotlin is set to take over this year. This new light-based wireless connection with data speeds 100 times that of Wi-Fi, will bring high-definition virtual objects into stores. Traditional Wi-Fi's maximum data rate is 7Gb/s, but can go beyond 100 Gb/s. LED lights can be harnesses to share and receive data while lowering internet traffic congestion. Li-Fi is also more secure; because light cannot penetrate walls, it is nearly impossible to hack into sensitive data transmitted on this network. With data confined to a room, it becomes more secure. Don't take our word for it – check out the Ted Talk where it was first introduced. Give a man a fish, feed him for a day. Teach a man to fish, feed him for life. This famous proverb drives the concept behind Machine Learning; building something to be intelligent enough to function autonomously. Machine Learning is imperative for the development of computer programs that can learn new information automatically and find hidden insights in complex data. These analytics can be used to predict customer behavior, figure out the optimal time to sell a stock, or suggest business strategies that the human mind is unlikely to create. For companies looking to upgrade their technology while tightening their belt, Machine Learning is the perfect solution. Netflix saved more than $1 billion this year due to their ML algorithm which helped recommend content for subscribers. As larger companies have begun to adopt this technology, it is quickly becoming popular among tech startups. It's no surprise that machine learning as a service (MLaaS) will be worth more than $20 billion by $2025. A step beyond Machine Learning, NLP is the computer's ability to analyze, understand and generate human speech. 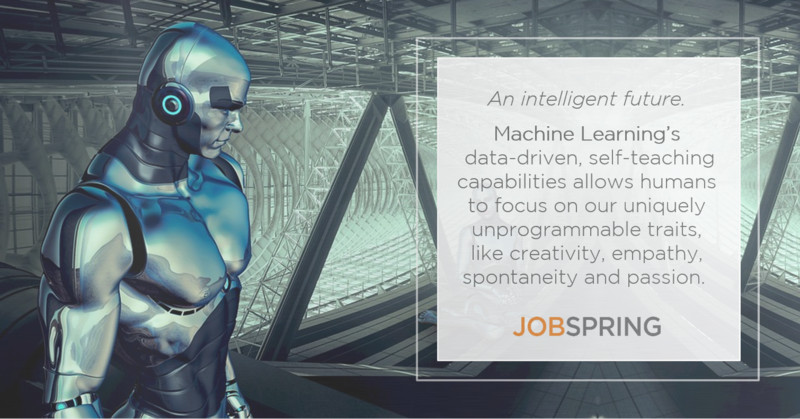 This in-demand skill for application developers working on AI apps with sub-skills including Python, Java, C++ and Spark. Natural Language Processing paves the way for us to communicate with computers using normal, everyday language, slang, and tone. With the help of NLP, people will be able to ask computers questions naturally and receive answers with more accurate insight to each query. This shift part of the larger trend evolving us further from screen and keyboards, and into a world where voice-assisted services like Alexa and Siri are King (or more accurately, Queen). We know that open source has been around for more than 20 years, but the concept of the open source software is more topically relevant than ever before. As privacy and monitoring scandals increase globally, Open Source Development strives to prevent abuse of the ideals and ethos that are pertinent to this movement. Android is one of the most-known open source platforms, a decision which has increased trust around their brand as opposed to the top-secret iOS code. The larger market is trending toward open source, as demonstrated by one of the largest open source cloud giants, Cloudera, that recently filed to grow public. Not to be confused with your last eye exam, Prescriptive Analytics is one of the most advanced iterations of big data. These analytics harness a variety of algorithms to offer recommendations for an optimal future outcome based on historical data. In the next year, we'll see companies begin adopting this technology, following companies like General Electric and DSW, which have already done so to drive their businesses forward. Few of these listed advancements would be tangible without the developments in computing power. From 1975- 2015, the power doubled every two years, then plateaued. The quantum computer promises to be millions of times faster than computers today. As opposed to traditional binary 'bits' (1 & 0), which can exist in both states simultaneously. Tech leaders are actively racing to launch the first commercially viable quantum computer, capable of solving problems that today’s computers can’t handle, and problems that we can’t even imagine, yet. One large step for man, one giant leap for robot-kind. As artificial intelligence gains popularity, robots become more intelligent, efficient, and valuable to humans. While artificial intelligence replaces our digital interactions and calculations, robotics will replace our manual actions, like carrying heavy groceries, cleaning homes and even exercising pets. 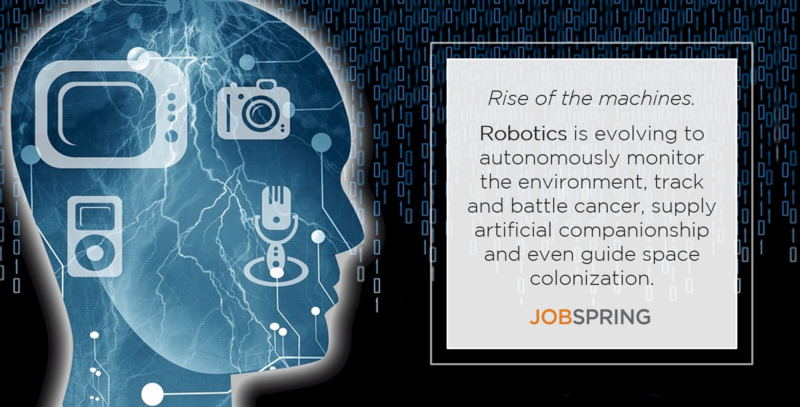 Essentially, any repetitive roles that human have, like assembly lines, will be replaced by robotics. But one question remains; with one robot running your house and the other doing your job, what's left for us? More competition means companies need better customer service. If you don’t answer quickly or provide good service, they’ll go to a competitor. The SaaS industry has been traditionally focused on broader business functions like HR, CRM, accounting, etc. According to Cisco's Global Cloud Index 2013-2018, almost 60% of all cloud workflows will be delivered as SaaS by the end of this year. Why the rise in popularity? Companies are seeing tremendous financial savings after converting from legacy-based systems. In fact, 38% of US businesses started fostering a SaaS-exclusive workplace in 2017, more than double the amount from the year prior. SaaS will likely continue its upward trend, as it is predicted to hit a public market value of $76 billion by 2020. With the growth of smart speakers and voice command, it is often unnecessary to look at a phone or computer to input data. Plus, as desktop devices are nearing obsolete-status, we’re approaching an inevitable overhaul in traditional user experiences. Expect to see new types of visual and audial cues as part of next-gen UI, including context-awareness, sensors and multimodal output capabilities. If you speak with Alexa or Siri, you are already using 'Zero UI' design, leveraging computer vision, voice control and haptics for a seamless interaction. VPNs are as old as the internet but is in the limelight as cybersecurity threats increase. VPNs allow users to mask their online identity by securely diverting all your web traffic so it appears you're searching the web as if you were in a different country. This real-life invisibility cloak makes it almost impossible for anyone to monitor their online activity. Power cords are like leashes for adults in the digital world. Rather than being tethered to the wall as your phone charges, brands like Powercast and Energous unveiling chargers that send power to multiple devices over the air. Headphones aren't far behind; smartphone makers are ditching headphone jacks for good, which is why sleek over-ear headphones to tiny buds that look like gemstones will be everywhere in the coming year -- so get ahead on your holiday wish list now. XR refers to the spectrum of experiences that blurs the line between the real world and the simulated world -- such as virtual and augmented reality. The technology immerses the user through visuals, audio, and haptic cues. XR is removing the hurdle of distance, increasing access to people, information, and experiences. If you live in (or watch HBO's) Silicon Valley, you know that incubators are one of the most effective way for small startups to grow into the tech giants they aspire to become. An incubators success is only measured by that of its’ startups. Y Combinator has gained a renowned reputation for being one of the best; their graduates include Reddit, Stripe, Airbnb and Dropbox. With a 7% equity in each of their clients, their value and reputation continues to skyrocket. The incubator is named after the mathematical recursive function, which performs itself as part of its total operation and is an essential part of computer programming. Since 2005, Y Combinator has funded more than 1,500 companies and their alum are valued over more than $1 Billion. This blockchain-based capability is a method used in cryptography to prove ownership of a specific piece of knowledge without revealing the content of that knowledge. ZKP enables transactions that safeguard users’ privacy and improves verification; one party can prove to another that a given statement is true, without revealing anything about the statement. As online privacy becomes a more prevalent debate, this technology provides a solution to make our information a little more private again. There are few that could have predicted at the turn of the 21st century what tech trends would be prevalent today; as of a decade ago, many of these terms like "edge computing" and "blockchain" hadn't even been mainstream language – if even ideas. As we consider the rapid rate at which tech trends have evolved in the last 20, or even two years, it is exciting – if not daunting – to consider how this will escalate in the coming decade. While there is no way to know for sure what trends will pop up, you can count on us to be sharing the latest with you. Disagree with any of the letters on this list? Share your comments and join the discussion.